Includes accessory delay, power locks, power front and rear windows, one-touch down power driver's side window and manually telescoping trailer tow mirrors with power and heated glass, integrated clearance lights and turn signals. Includes pre-selected springs, extra heavy duty alternator and unique fan clutch. Includes transfer case and fuel tank skid plates and unique 4 x 4 pickup box decal. Includes chrome front bumper, dual beam jewel effect headlamp and underhood engine compartment light. Buses, recreational vehicles and emergency vehicles are exempt from the Idle Engine Shutdown requirement nationwide. Other state-specific exemptions may apply. Selecting this code confirms that the customer intends the final configuration to be exempt. Includes premium AM/FM stereo with MP3-capable in-dash single CD player, 4 speakers, auxiliary MP3 audio input and clock. Vehicles that do not qualify for Engine Idle Shutdown Exemption (63E) and are not intended for registration in CA, CT, DE, GA, ME, NJ, NY, NC or PA are not required to be equipped with idle engine shutdown. Dealers in affected states can select this code if the vehicle is not intended for registration in CA, CT, DE, GA, ME, NJ, NY, NC or PA.
Includes heavy service front springs (1 Up upgrade above the spring computer selected as a consequence of options chosen. Not included if maximum springs have been computer selected as standard equipment), slide-in camper certification and auxiliary springs. Required on 6.4L diesel engine with automatic transmission in the following states: CA, CT, DE, GA, ME, NJ, NY, NC and PA. 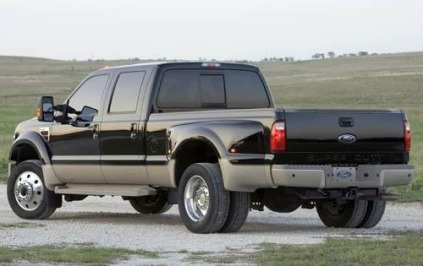 Optional on 6.4L diesel engine with automatic transmission in all other states. Can be deleted for vehicles ordered by dealers in CA, CT, DE, GA, ME, NJ, NY, NC and PA for delivery outside of those states. California and affected green states require non-exempted vehicles with diesel engines rated over 14,000 lbs. GVW to incorporate an idle shutdown system to prevent extended engine idle periods. After a pre-determined period, the engine PCM automatically shuts down the engine and triggers the accessory module to shut down power to the accessories to minimize battery drain. 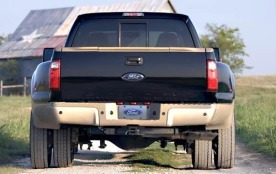 Includes 4.88 limited slip rear axle, increases GCWR from 26,000 lbs. to 33,000 lbs. and upgraded rear axle.